So, you have an audio or video file that needs transcribing? Great. You’ve come to the right place. Having the ability to convert audio to text automatically saves media professionals, or really anyone who deals with audio files on a regular basis, countless hours in their day. It’s tedious work to transcribe an audio file. In fact, it takes the average person anywhere from 4-8 hours to transcribe a video that is one hour in length. For most busy professionals, those are hours that could be better spent. Podcasters to reach a larger audience and improve SEO. Journalists to quickly find quotes within a lengthy interview. Radio broadcasters to make their content searchable online. Higher education to dictate a dissertation or lecture. Advertising agencies to search audio for mentions of their brand. Content marketers to find tweetable quotes and repurpose webinars. If you’ve never tried our automatic transcription software, there’s more good news. Upload your first file, and we will automatically transcribe the audio to text free. Regardless of length. After that, additional files are just $0.10 per minute. Here’s how you can automatically transcribe audio and video to text in just a few minutes. We’ll walk you through the very simple three-step process. Find the audio or video file that you want to transcribe. Make sure that your file has minimal background noise, no heavy accents, and ideally no more than one or two speakers. Temi can transcribe audio files with less than perfect sound quality, but the transcript output won’t be as accurate. 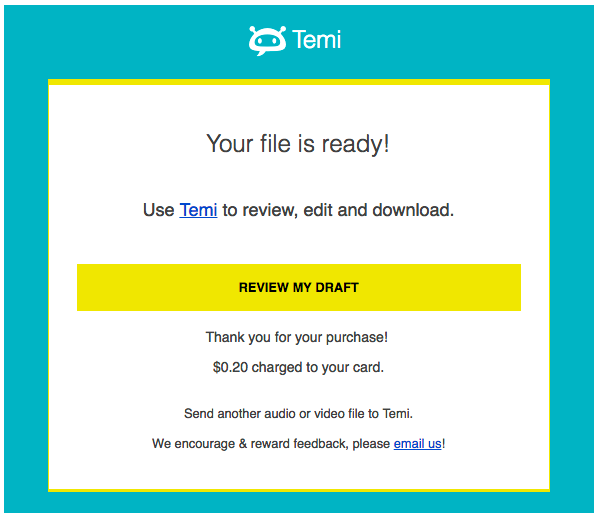 Temi transcribes audio and video recordings in MP3, MP4, WMV, AIF, M4A, MOV, AVI, VOB, AMR, WMA, OGG, and WAV. Download or upload your file to your desktop where it can be easily accessed. From here, uploading your file to Temi’s automatic transcription generator is super easy. Click “Select audio/video file” and grab the file that you want to auto-transcribe. Your video will upload automatically, it only takes a few seconds. Enter your email address to have a copy of the transcript delivered right to your inbox. You can typically expect your transcript to arrive within 5 minutes, but the process can take longer depending on your file length. Your first file is free. If you’ve used Temi before, you’ll be prompted to login and enter your credit card information. The file we uploaded was two minutes long. At ten cents per minute, it will cost twenty cents to transcribe the file. Not bad, right? Next, you’ll receive an email with a link to your freshly transcribed file. Click “review my draft” to check it out. Within the Temi editor, you can modify, save or download a draft of your transcript into a DOCX, TXT or PDF file. You can also share a link to your file within the Temi editor with another person, but keep in mind that they will be able to edit your text. You can see how the text highlights in the transcript as the audio or video file plays — our customers tell us that this is one of their favorite features in the editor. This feature makes it easy to follow along and see the exact timestamps and speaker names synced with corresponding content. So, there you have it. Everything you need to transcribe audio to text free (for the first file that is). Questions? We’re here to help. Please feel free to reach out to our team at temisupport@temi.com. Do you have transcriptions to spanish? We currently only offer English transcription. Please let us know if we can help with anything else! I have large video files (1 GB) that I have uploaded to you tube that I would like to transcribe. I would rather not upload them to Temi too. Is there any way you can work off a You Tube video? Hi Sunil, Supported URLs are a highly requested feature and one that we’re going to be launching next week. In the meantime, you will have to upload the file to Temi. Please stay tuned though, I’ll update you here as soon as it’s live. Thanks for that feedback, Naveen. A PayPal option is something we’re working on. Any closer to getting a Paypal option? I love the idea for this service but I don’t feel comfortable providing my credit card. Hi Leah, Yes! There is now an option to checkout using your PayPal account. I’ve never heard of Temi’s automated transcript generator before so thanks a lot for the information! Quite often I need to transcribe media files (wav file to text, etc. ), so I found this tool very helpful. However, I wonder how accurate it is. I’ve heard that converting apps and software can’t guarantee 100% accuracy and only a professional can present you an accurate file. What do you think? Besides, will your tool be able to detect and correctly transcribe confusing and similar in sounding words? Automatic transcription is far from 100% accurate, but it’s the fastest way to get a rough transcript of your audio. We recommend using our transcript editor to clean up imperfections. Or, if you need a transcript that’s more accurate, use a human transcriptionist via Rev.com for $1/min and 99% accuracy guaranteed. How long does it take for an audio file to be processed? The processing time depends on the length of your file, but on average, it takes roughly 5 minutes to transcribe a 30-minute file. Hi Dana, For international customers, we recommend using PayPal. It’s both easy and free to create an account. Hi. I just want to know that does Temi’s automated transcript generator transcribes Urdu audios? Hi Raahim, For the time being, Temi can only transcribe English audio to English text. We’ll definitely keep you posted when we begin to support other languages. Can you transcribe files with music on them, like an audio meditation? Hi Meg, Automatic transcription is best when there is little to no background noise. So, in your case, it would really depend on how loud the music vs. the person leading the meditation is. You can try your first file free and if you’re not happy with the quality, we recommend checking out rev.com/transcription. Rev’s human transcriptionists can easily separate the meditation from the background music, giving you an accurate transcript. OMG. Temi just changed my whole life. And almost instant transcript for a 10minute program that I could edit for emphasis and time stamp. The savings in time, much less aggravation, is priceless. Thank you for existing! I find your tools is very helpful for me and i have a lot of video and audio file with different sizes that i need to be converted into text file. can you tell me the cost of this temi transcriptor? Hi Anand, Your first file is free to transcribe and after that, it’s 10 cents per minute.